Java is the best programming language available today that works across different platforms. I love Java and JavaFX. Once you finish writing your application, you may want to release it. The problem is, the native Java program executable, the good old .jar files always have a cup icon and sometimes a simple double click wont open them. The solution to this problem is to convert JARs to native executable, for windows .exe files. In this article, I will explain how to make windows executable (.exe) from your Java / JavaFX program. Having exe file for windows has many advantages. We can set icons, properties, version information etc. The first step is making a JAR file from your java code. This is pretty simple if you are using an IDE like NetBeans. 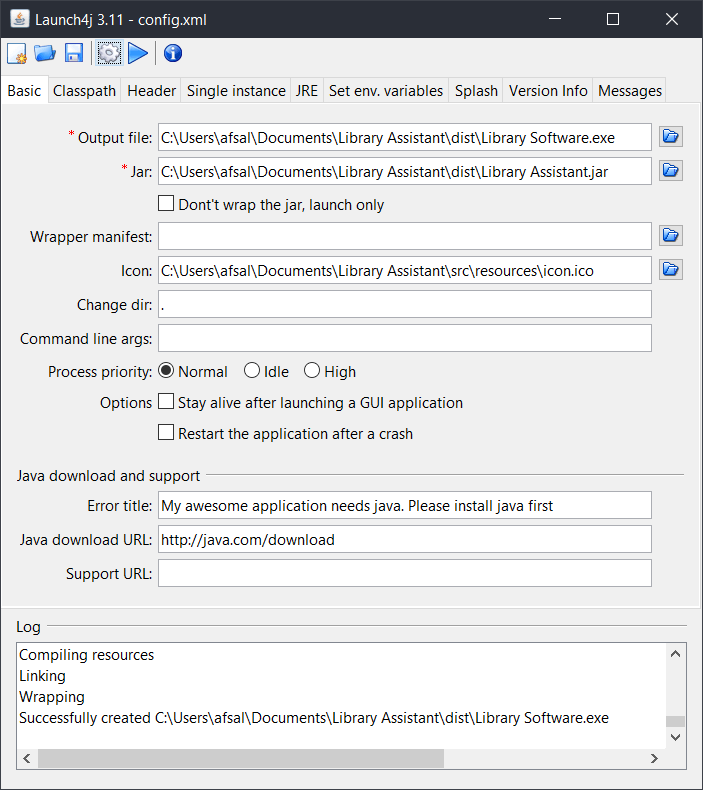 NetBeans : NetBeans provide option for making JAR file very easily. Just right click on your project from Projects window and then select “clean and build”. This will create a folder called “dist” in your project directory. Inside dist, there will be the final JAR. All the libraries required for running the program will be inside “/dist/lib” directory. Maven : Maven uses convention over configuration, this means that you only need to tell Maven the things that are different from the defaults. You can use “mvn package” command to create JAR files. Launch4J is so far the best wrapper available for converting JAR files to windows executable. It is written in JAVA and is open source. Download latest version of Launch4J from http://launch4j.sourceforge.net/. Once You install and open it, you will get the following screen. On the first look, the interface may look little confusing, but it is actually simple and every field will become too important once you get used to it. This tab contains the most basic configurations for the exe like jar file to be converted and the icon to be used. You can specify manifest file here. This will be used for processing the application against User Account Control(UAC) in windows. Here you can specify the icon. It has to be in ico format. Change current directory to an arbitrary path relative to the executable. If you omit this property or leave it blank it will have no effect. Setting it to . will change the current dir to the same directory as the executable. .. will change it to the parent directory, and so on. 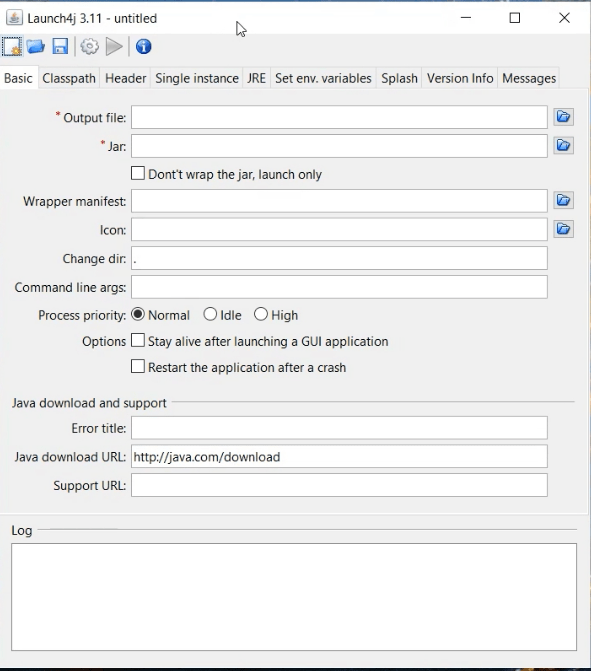 In case if the system doesn’t have supported Java, the error message and URL to download can be specifed under the Java Download and Support Sections. Here you can specify classpath for your main class. Select the JAR file by selecting the directory icon from right and the default classpath corresponding to main class will be loaded. You can edut them from Edit Item text field. You can also add or remove classpath for given main class from this section. Here you can specify whether you need only once instance of the application running at a time. Give a mutext name and window title if single instance option needed. This section allows configuring JRE. If you are bundling JRE with your product (Which is not a good idea at all), you can specify the path here. You can check the ‘Fallback option’ so that the bundled JRE will only be used when the JRE isntalled on the system does not matches with min and max version requirement. Min JRE Version is a mandatory field and it has to be specified.You can also specify Heap parameters or any JVM options in the corresponding fields. If you need a custom splash screen, you can check the “Enable Splash Screen option”. Then specify the file (Either bitmap image or JAR file). In the TimeOut field, time out can be specified. This is a good way to properly specify version information for your executable. This entries will then be shown in the properties section of executable. Messages section allows to create custom messages when errors occur. You can enable this option by checking “Add custom messages”. Once the entries are filled, you have to save the configuration. For saving, click on the Floppy DIsk icon from the menu. Your configuration entries will be saved as an xml file called config.xml. After saving click on the Setting like icon next to save button to start converting to executable file. You can start your program from executable by clicking on the Play button from menu.